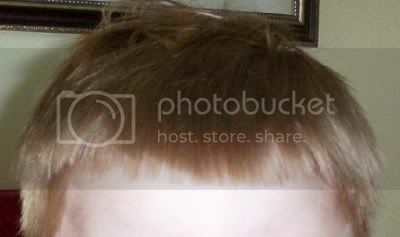 When your child gets a really bad haircut, everyone automatically assumes you cut it yourself. No, that's what so maddening : ) My son's hair has several crazy cowlicks, making it impossible for me to cut at home (we do cut my husband's). I tried to warn this stylist, but she didn't listen. Just kept clipping. And clipping. At least it should grow out by Easter! Awww...cowlicks. A friend of mine has a ton. His father said to him once that most people have bad hair days...he's having a bad hair life! A good stylist finally fixed that though. It's a shame yours did not listen!